It’s going to be tofu, tofu and tofu this week with the pile I have made. I had sweet and sour last night. It was colourful and totally vegetarian, very nice. Here is the result and what I did. Cut 2 big pieces of tofu into big bite chunks then lightly coat with seasoned plain flour and shallow fried till light golden and crispy all sides. Take out and drain on kitchen paper, keep warm in oven while making the sauce (don't keep in the oven for too long, or it will be soggy and chewy). Fry the garlic and onion with some cooking oil, stir till fragrant. Add the pepper chunks, stir till slightly soften then add the remaining ingredients and cook till the sauce is lightly thickened (don’t make the sauce too thick). 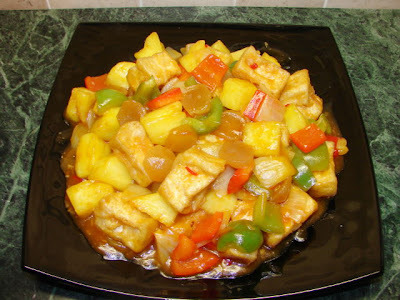 Heat off, quickly stir in the fried tofu pieces and serve immediately. Lovely - I was looking for something meat free (I consumed masses of steak in France) for Tofu Tuesday and I think this fits the bill perfectly.